A decree issued from Westminster in 2013 comes in to force in just over a month, meaning the nation's larger organisations will face mandatory audits of their energy use. The International Accreditation Forum (IAF) confirmed late January that the International Organization for Standardization (ISO) will pursue the creation of the first global database of ISO 9001 certifications. 2013 proved a quality year for Dunfermline-based quality management trainers and consultants SQMC. The Scottish Quality Management Centre (SQMC) continued to beat current economic trends by increasing its turnover by over 10% in 2013. Food safety is essential for food suppliers of all sizes and simple steps taken to audit your organisation’s BRC Food Safety processes and continually monitor your Food Safety Management System can go a long way to guaranteeing the quality and source of your products. Our building closes this evening (20th December) for the festive season; opening again on Monday 6th January 2014. We welcome your bookings onto public courses via the "Course Dates, Locations and Prices" module, as usual; and our admin team will respond to you on our return. 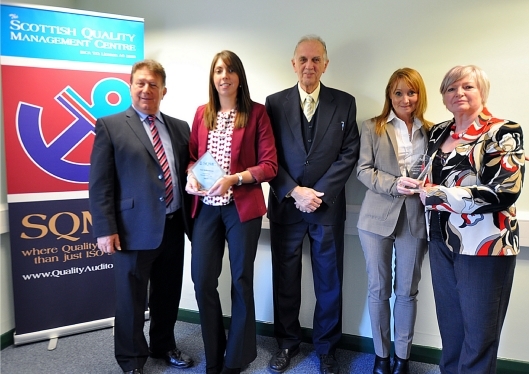 As part of its World Quality Day celebrations on 13th November, the Scottish Quality Management Centre (SQMC) presented awards to two inspirational women from Inverness and Prestwick, both working in the field of quality management. ISO 9001 Q & A: "What is meant by 'Quality Objectives'?" With this being the United Nations' 'World Quality Week', what better topic for Ron's Q & A video than this? A fundamental principle for effective Quality Management, but a clause of 9001 that is often misunderstood or neglected. World Quality Day (WQD) is almost here and SQMC has a special event lined up to celebrate. 2014 marks a dramatic step forward in the Scottish Government’s commitment to reducing commercial waste through the introduction of legislation, entitled Waste (Scotland) Regulations 2012. This legislation, which begins to come into force at the turn of the year, will affect all businesses across all sectors, but there is help available to reduce the potential impacts.